There are a couple of cinema-worthy chase scenes going on right now, all located in the Southern Ocean. The New Zealand navy is currently chasing two ships sailing under the flag of Equatorial Guinea for illegal fishing, and a Sea Shepherd vessel has been chasing a Nigerian trawler, the Thunder, since December 17. The Sea Shepherd chase, over 1000 nautical miles at this point, has already broken the record for longest documented sea chase. And it’s not over. So, what’s at the heart of this high seas drama? A deep-sea fish that was once deemed bland, ugly and unmarketable. It got its commercial start as a base for fish sticks. Later, its lack of overtly fishy flavor was turned to culinary advantage because chefs could do almost anything to it; what it lacked in strong flavor it made up for in flaky white flesh. The Patagonian toothfish (Dissostichus eleginoides) was renamed the Chilean sea bass by an American fish merchant in 1977, and became truly popular in haute cuisine during the 1990s. Also known as White Gold, the fish otherwise known as toothfish can currently be found on the menus of high-end restaurants mainly in the United States, Europe and Japan. Since luxury markets combined with scarcity usually mean high prices for a product, illegal fisheries have been chasing the toothfish for years now. A number of international initiatives were undertaken to protect the toothfish, an animal integral to a number of ecosystems. It reproduces slowly and has a long life span – up to 50 years, two factors that make it vulnerable to overfishing. For me, the Patagonian toothfish, together with the Antarctic toothfish (Dissostichus mawsoni) also sold as Chilean sea bass, exemplify how difficult it can be to be a responsible consumer. In the early 2000s, illegal, unregulated and unreported fishing (IUU) was estimated to account for up to 80% of all toothfish that was harvested. Recommendations to avoid Chilean sea bass in stores and restaurants have been cautiously revised because of the success of programs in fighting IUU fishing. The Marine Stewardship Council offers certification for sustainably fished toothfish, and provides possible purchase points. And yet, we have two groups, a national navy and an environmental organization, in pursuit of industrial-scale operations fishing for what will be sold as Chilean sea bass. The poachers obviously have reliable markets to whom they can sell. Chilean sea bass with the MSC label can generally be bought with confidence, but how often do we ask our restaurant servers or fishmongers whether the fish they are serving is appropriately labeled? 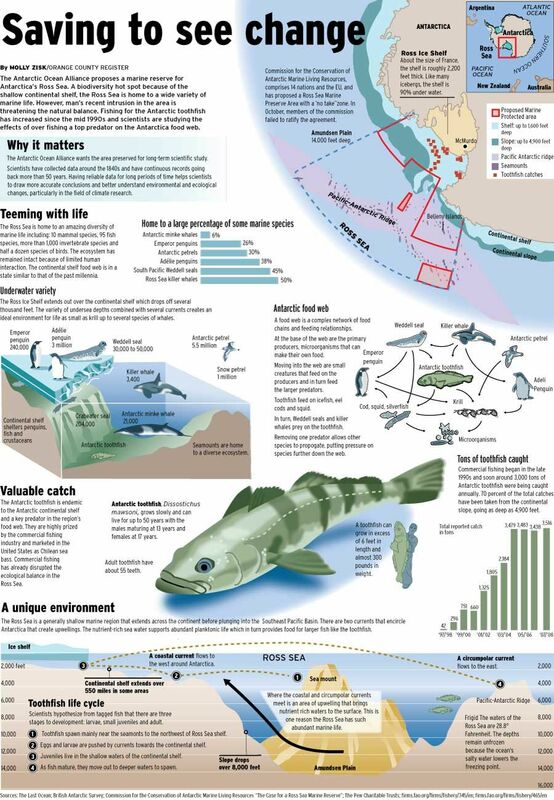 Levels of toothfish over-fishing (2013). Dark grey=quota levels, Red=estimated IUU catch. Click on the image for a larger view. * The Sea Shepherd’s spectacular chase only ended in April, with the crew of the Thunder allegedly sinking their own ship to destroy evidence – and then being rescued by crew members of the Sea Shepherd’s two pursuing ships. A riveting article in the New York Times provides more detail than I can here, and I encourage taking the time to read it. The ships being pursued by the New Zealand navy have been found in Thailand and Cape Verde, respectively – renamed and reflagged.